"Oh, I don't mind your prickles!" 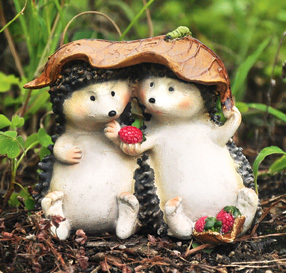 Two little hedgehogs snuggle together, sharing the shelter of a single leaf. There's even a few berries for snacks! 2 1/2" high celebration of friendship. A nice selection of "Fairy" items for my Gaelic wifes' garden. Good quality and fairly priced. you guys are totally AWESOME!!! Absolutely great service! Very nice items and the shipping was the greatest. Will definitely use you again. I have purchased (and will continue) to order this special gifts for my friends. Your gifts, apparel, jewelry, coupled and outstanding customer services are both excellent and outstanding. Arrived promptly and well packaged. The hedgehogs are adorable and flawless and I'm very glad I bought them.